Owning a business that has multiple services to offer is favorable in terms of traffic, leads, and conversion. When you have many services to provide online, it’s like having many doors open for people to come to you for their various needs. This improves your business’ online discoverability and provides your prospective customer the exact information they want to search and find out. Having many services means you have a set of reasons to engage in business with your customers as a dependable service provider. And it is highly recommended to have separate landing pages for this purpose. If your business is offering multiple services and you want to provide all those services and their details in one single landing page, that’s likely to be a page of madness from the perspective of a viewer. Because, it will be difficult to focus on a landing page that has information overload. Users will be confused to look where first. To find the particular service they are looking for from the calamity of information provided will be a headache. Similarly, providing content in white text on a black or dark backdrop must also be avoided. Such a page makes the user flip over to something else easily as it looks cluttered with too much information and clatters due to the discordant and irritating color choices in it. They might not even feel like going deeper into details if what your page offers is nothing but disorganization and confusion right from the get-go. When you have separate landing pages for each of the services you provide, it can help target a searcher who is specifically interested in a particular service. This specific page can be easily accessed using a search engine provided you type the right keywords for search. The searcher will be taken directly to the landing page of the relevant service. This is called message match. For example, if yours is a water damage restoration company, you can have independent landing pages for each of your services such as Water damage cleanup, Water damage repair, Mold remediation and so on. So if a person searches for mold remediation services, he will land on the exact page that is exclusively allotted for mold remediation. This will help reduce bounce rates. Because one of the reasons why users leave websites as soon they enter is message mismatch. If you have separate pages per service, the ads that are part of your campaign can be targeted to the audience interested in the page of a relevant service. You can make effective use of your CPC and increase conversion rates using this method. Because you are no longer getting unwanted clicks and hence unwanted expense. You will get a good Quality Score from Google AdWords and this will reduce your CPC. Whatever you advertise to reach the right audience, and because of this, you receive quality leads and eventually multiply conversions. When there are multiple services, you need to focus on each individually. This will help you identify how each of them is working. Having separate landing pages will help A/B test to check what is working and what isn’t. By using Google Analytics, you can measure which service is currently performing well and which one is lacking momentum in order to make appropriate changes. Reporting these data will help your campaigns improve by reducing mistakes. You can push those services that are not working well with some new marketing and advertising strategies that boost those particular services. Assessing the performance of your services individually can also provide you insight while making plans for future growth. Using separate landing pages for different services will reduce bounce rate because your page will look clean and tidy and the visitor would stay on that page for a longer time. When the page is unsophisticated, people tend to take an action easily. You need to make your landing page forms as simple and short as possible because most of the people will leave your page immediately if you provide them with a long and complicated form to fill. According to a QuickSprout infographic, landing pages have an average bounce rate between 70 and 90 percent. In order to minimize the bounce rate, you need to navigate your visitors to other pages of your website. This is possible with blog pages, home page etc. But in the case of the landing page, there are no other pages to which you can navigate other than the page that shows “Thank You” once you are converted. So minimizing the bounce rates of landing pages is a tough job. You have to optimize your landing page to reduce the bounce rate. There are some landing pages in which you are linked to the home page when you click the logo. This will show a low bounce rate. But you can’t be happy seeing this. This low bounce rate is useless as it does not lead to any conversion. Keep in mind the fact that a low landing page bounce rate is not desirable if your landing page has outbound links in the navigation, logo, and the footer. After making your landing page free from outbound links, and still, you get low bounce rate, then this indicates that people are not leaving your page and this will obviously increase your conversion rates. When a searcher looks for a particular service you provide they should be able to land on the exact landing page of that particular service without any confusion. If this is not attained, it is a message mismatch. If there are too many services, you could categorize them in each of your landing pages to make it look better. People will then look at the category and find the exact service they want. Giving them the exact thing they want will automatically reduce bounce rates. If you are providing a long form for your fleeting visitors to fill, they are likely to scoot fearing the amount of time they are going to waste filling that extremely boring form. People choose only those things they can easily access and use. If your page is taking a good amount of time to load, then you must consider a reconstruction and refinement to avoid unwanted load and waste of time. Limit your page elements.According to Google, 70% of pages they tested were over 1MB, 36% were 2MB, and 12% were over 4MB. By using a fast 3G connection, 1.49MB takes around 7 seconds to load. This is due to the overload of too many page elements (images, headlines, buttons, etc. ), and the result is that the visitors become impatient and bounce before they even see your page completely. To rank on the first page of the search results, you need to have a speed of 3 seconds at least. Fix a speedy performance budget.Before you begin creating your landing page, determine how fast you want it to load — aka “the budget.” From that budget, choose the elements you can include on your page to meet it. In the case of a lagging page, the best solution is prevention. Avoid too many images.Always remember that Favicons, logos, and product images can easily contribute to ⅔ of a page’s size. 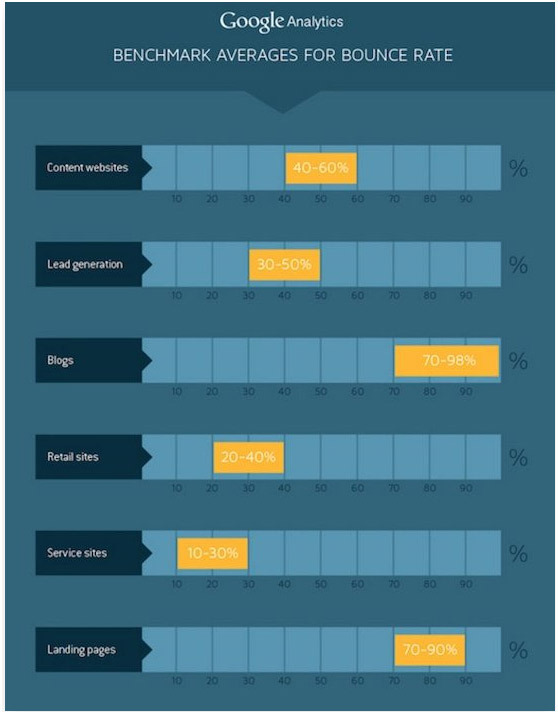 Researchers found that, compared to pages that couldn’t convert visitors, pages that could featured 38% less images. If you absolutely need to include all those images, you can at least consider using an image compressor to compact their size. Wrong traffic that is generated by low-value referrers, direct links from other websites, search engines, loyal visitors etc. can increase bounce rate by attracting users who will not add anything to conversion rates using the landing page. Such users are not like those who visit your website after viewing an ad or receiving an email. They reach your landing page out of curiosity of some kind or by an admiration. Such traffic will not necessarily lead to conversion as they are either not readily interested in your services or they are not depending on your marketing strategies in their responses to you. For this reason, they can’t be reckoned for driving good quality traffic. It is most important to have an eye-catching and less ambiguous CTA that will not impart any fear of losing money to the not-so-web-savvy users. CTA should be given in a catchy way using a color that is contrastive to that of your website. It should be placed appropriately and should have a size large enough so that it will not be left unnoticed. Your copy should make the user want to act immediately. Using a sense of urgency will work to create effective CTA. It has to be a concise, jargon-free, easy to understand the phrase that will catch the attention of the users to take an immediate action such as download an ebook, get a sales demo, sign up for a weekly newsletter etc to list a few. One thing is important that users should know what will happen once they click the CTA. Your users don’t want to waste their time reading every bit you write. They kind of scan the content when they read your website content. They are visiting your landing page because they searched for something they want to know or buy. They just want to check what you provide is what they want at the moment. If the necessity they are in matches the solution you provide, then that will take an action. They just don’t want to listen to all the lectures you serve. They just skim across what you write. So your content has to be precise and up to the point. Your writings should be legible. The reader should be able to distinguish the characters in your writing without any difficulty. Your font choice should not be one that makes it strain to read. While reading the content, the reader must be able to understand and retain the information as long as it can be connected to the next sentence adding meaning to the whole paragraph. Cutting down larger sentences to smaller ones will make it easier for the reader to form an idea of the topic being discussed. It will make reading an easy process and provides clarity and totality to what is perceived as a result of reading. Your content must have readability. This quality is attained by making huge paragraphs to shorter chunks so that the reader easily gets a mouthful at one time and can digest it instantly. Giving proper headings, subheadings, spacing and making the paragraphs as small as possible will increase the readability of the content. As we are dealing with multiple landing pages for specific services, each page’s content should be unique to get rid of any duplication or spam issues. If you create valuable content that are brief there are chances that users share it with others using social media. The visitor must be able to take an action immediately without any confusion or waste of time. This should result in a huge amount conversions that will take your business to the top without much fuss. Are You Struggling with Your PPC Campaigns and Online Marketing? Fill Out the Short Form Below to Schedule a Free Consultation with Our Team of Experts.